The City of Rockville voided a speed camera citation issued to a school bus after a request by the Montgomery County Board of Education. 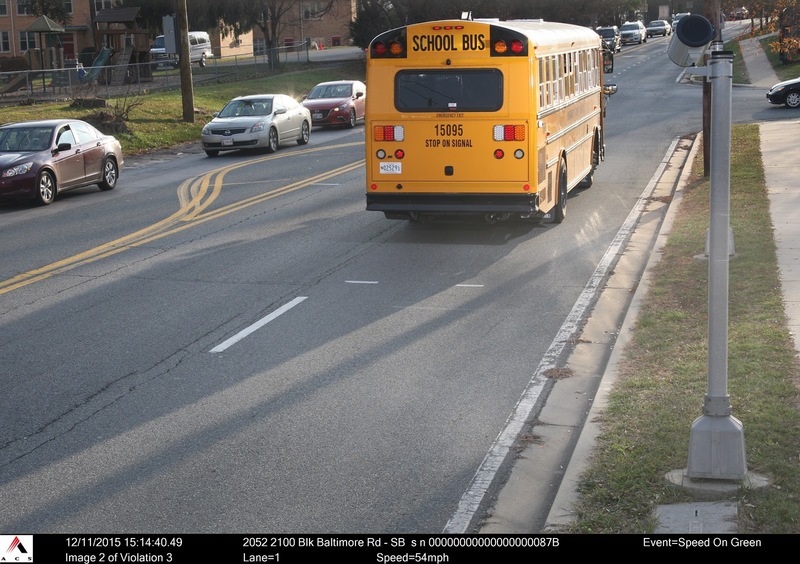 Documents obtained by the Maryland Drivers Alliance show that citation number RK004432787 issued to a Montgomery County school bus was voided as a speed measurement error. The City of Rockville speed camera located at 2100 block of Baltimore Road and run by contractor Xerox Corporation, claimed the bus had been traveling 54 MPH in a 25 MPH zone -- more than twice the legally posted speed limit. "As I understand and supported by bus telematics, the bus was not violating and the large surface area of he bus reflected the radar beam onto vehicles moving in the opposite direction, which presented the "shift". The system measured the shift and calculated a higher speed than the bus was actually traveling. This is a known possibility and we should have caught it in processing." The Maryland Drivers Alliance requested the calibration records for the speed camera which issued this citation, which revealed that the camera was a Mesa Engineering G1-ATR. The calibration records for the Rockville camera which erroneous recorded this school bus's speed showed that both the daily and annual calibration tests for this device PASSED. Normally the fact that a device has passed its calibration tests is considered ABSOLUTE PROOF OF GUILT, since the devices are assumed to be accurate. The Mesa Engineering G1-ATR is the same model of cameras had previously been used by Baltimore City before their program was shut down after revelations about systematic erroneous citations. An investigation by the Baltimore Sun revealed that Baltimore's program had issued citations to stationary vehicles, and other cases had been documented in Baltimore where trucks were cited for traveling at twice their actual speed. Xerox was forced to acknowledge that these errors were due to what they described as “Radar Effects”, and an audit of their program revealed as many as ten percent of citations may have been issued in error. Documents we obtained from Baltimore City in 2013 showed that cameras which issued erroneous citations in Baltimore also passed their annual and daily calibration tests. For comparison, the calibration certificate below applied to a Baltimore City speed camera which issued a citation to a stationary car. 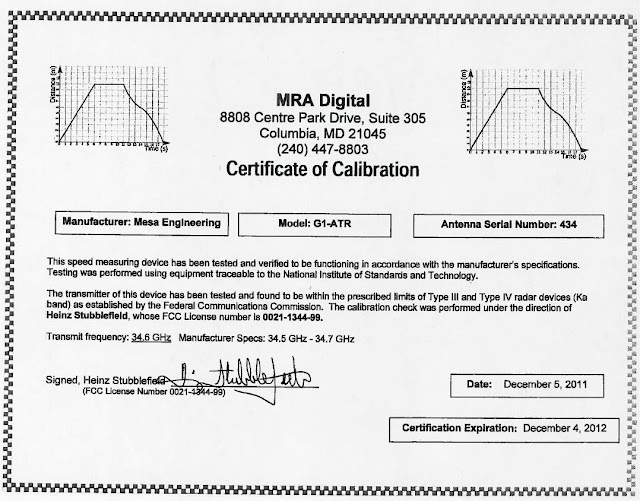 The annual calibrations for Rockville's cameras were performed by the same company as the one which approved the calibration certificates we obtained from Baltimore's program: MRA Digital. 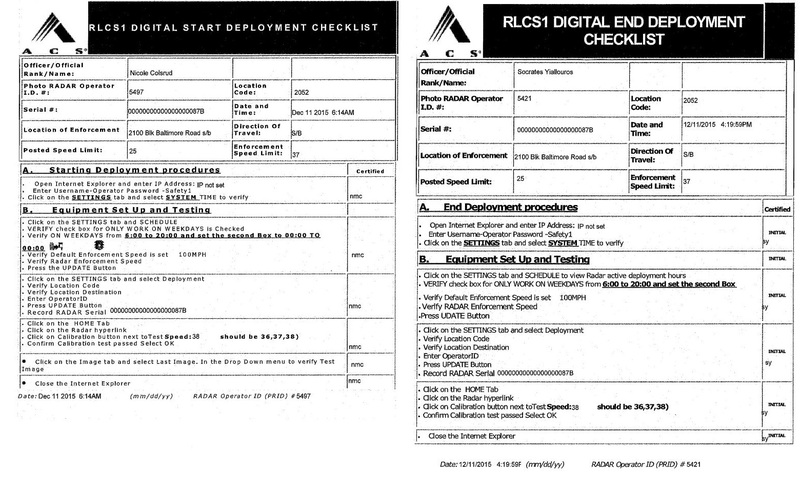 Both the City of Rockville and City of Baltimore calibration documents were signed by MRA Digital president Heinz Stubblefeld. We note that nowhere on these certificates does it claim the device was certified “to accurately measure speed”, nor does it claim the devices were certified to be appropriate for any particular purpose. In fact there is no evidence on the certificate itself indicating that any form of speed measurement testing was actually performed. The statement on the certificates that the device was "found to be within the prescribed limits of Type III and Type IV radar devices (ka band) as established by the FCC" sounds impressive, except that the FCC doesn't set standards for radar accuracy. The FCC only specifies what frequency a device is supposed to operate at, which has nothing to do with whether it is suitable for any particular purpose. Also the scientific-looking little graphics on the calibration certificates are simply stock images taken from Wikimedia commons which have nothing to do with the testing of the devices. Nevertheless such calibration documents are considered entirely valid under Maryland law and would be considered absolute proof of the accuracy of a device in Montgomery County District Court since Maryland law does not specify any particular standard to which devices must be tested. Similar documents signed by Mr Stubblefeld and MRA Digital have been used as evidence thousands of time and are accepted by the court as reliable testimony of the accuracy of equipment without question. The documents also show that this particular citation allegedly passed inspection by a Rockville City police officer. Documents show that Corporal Norman Paul "signed" a statement stating that "based on my inspection of the recorded images produced by the speed monitoring system in this case, which images are copied on Citation No RK004432787, the motor vehicle depicted in the recorded was being operated in violation of subtitles 8 of Title 21 of the Transportation Article of Maryland Annotated Code." (ie speeding). However Corporal Paul was incorrect, as the later examination proved that the speed measurement device was in error. It is unknown at this time how many other speeding violations Corporal Norman Paul has testified to the accuracy of. Most local governments currently assert the only purpose of citation images is to confirm that the vehicle was "present and moving", which this school bus was. The cameras in Baltimore City where systematic errors were documented provided defendants with VIDEOS of violations, making documenting a pattern of errors possible, but Rockville provides no such videos so proving a pattern of errors in the same way would be far more difficult, and requirements that citations provide enough information to verify speed have been strongly opposed by local governments including Rockville and Montgomery County. Had this citation been disputed in court, the above documents would have been admitted as evidence. Given that all of the documentation for this particular citation was seemingly in order, a defendant who didn't happen to be operating a vehicle on behalf of a local government would have had ABSOLUTELY NO CHANCE disputing this ticket by claiming the device was in error. It is highly unlikely that a motorist driving a privately owned car would have been afforded any benefit of the doubt by either Rockville or Montgomery County in such a situation. Motorists have alleged speed measurement errors in other cases, and had their cases rejected by so called "ombudsmen" without the detailed analysis performed in this instance. 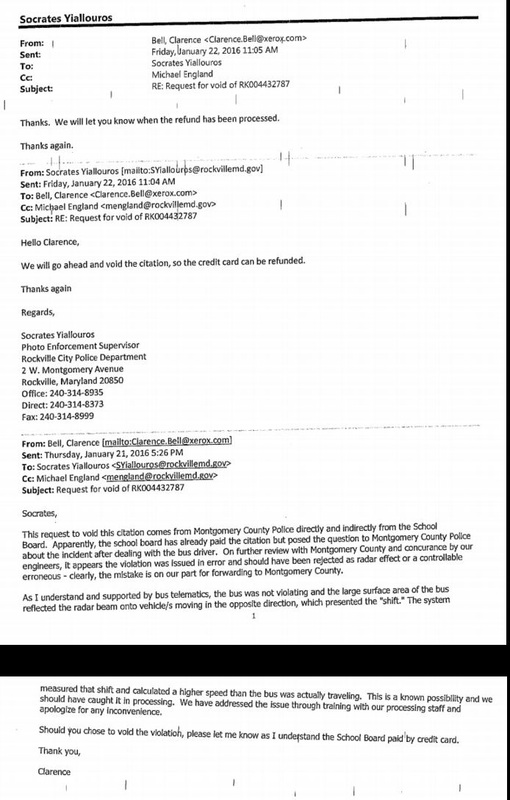 Rockville nevertheless dismissed this citation issued to a local government operated vehicle upon request of the Montgomery County Board of Education.